The Korg Modular will be the Japanese giant's eighth addition to the Volca series. Each one focuses on a particular task. So far we've had bass, keys, analogue drums, samples, FM, kick drums and mixing. 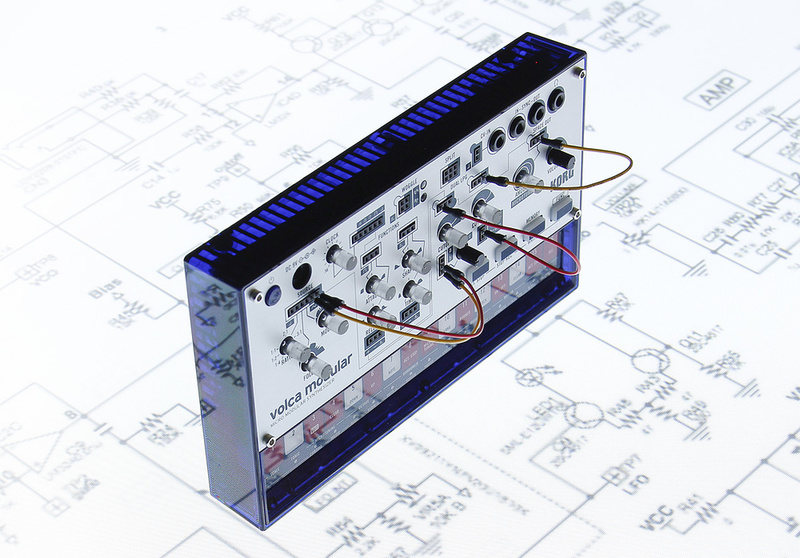 The latest adds something you might not have seen coming: West Coast modular synthesis. Bob Moog and Don Buchla were both developing synthesizer technologies in the 1960s on different sides of the USA. Moog started his work in New York, whilst Buchla was over in California. They both had distinct styles and their geographical polarity gave them the monikers, East and West Coast. Moog's style centred around subtractive methods involving the now ubiquitous oscillator, filter and VCA topology. Buchla's techniques employed wave folding and frequency modulation to control harmonics, and used low-pass gates and function generators instead of filters, envelopes and LFOs. The huge popularity of Moog-style East Coast synthesis means we all know how an 'analogue synth' sounds and functions. West Coast techniques on the other hand have remained relatively underground and exist almost exclusively in the modular domain. High prices and the less pragmatic, more experimental nature of Buchla synths made them less common. Korg must be commended therefore for choosing the less obvious route for the new Volca Modular. I'm sure we're all familiar with the Volca format by now. The plastic case, built-in speaker, battery compartment for six AA batteries, touch-sensitive keyboard and on-board sequencer are all present. Connections along the top include a 9V DC power input (as with other Volcas, the adaptor is not included) as well as mini jacks for Sync in and out, a CV input and the main audio output. Being a modular, there is of course a need for many more inputs and outputs — 24 inputs and 26 outputs to be precise. The size of the Volca means that Eurorack mini jacks are out of the question, and so Korg have opted to use small pin connectors. A generous bag of mini patch cables is included. Each cable has a sharp pin on each end which slots neatly into the sockets spread around the front panel. This works well enough, although I found it all too easy to bend the pins when moving pots or making additional connections in an already crowded pin matrix. Inputs and outputs, both audio and CV, are helpfully marked on the front panel and every connection has either a symbol or a guideline showing you which control it's connected to. If you have failing eyesight, or like to work in dark studios, you may find yourself squinting a lot. As with many of the previous Volcas, any control which can be modulated is given a clear plastic control through which a red LED shines in order to show you the current value, useful when you patched something days ago only to return to it wondering what on earth is modulating what. How Many Modules Can You Fit In A Volca? Korg have packed a lot in: a dual oscillator, capable of wave folding and frequency modulation, two function generators, two low-pass gates, a utility module, a 'Woggle', a splitter, a sequencer and a digital effect simply known as 'Space Out'. Many of the modules are internally connected, allowing the synth to be used without pin cables. Price is yet to be confirmed at the time of going to press, but expected to be comparable with other Volcas. Price is TBC at the time of going to press, but expected to be comparable with other Volcas.